AGARTALA/AIZAWL, Oct 2: With the Centre deciding to stop relief from Monday to over 32,000 Reang tribal refugees living in north Tripura for over two decades, it is not clear if they will start returning to Mizoram although nearly 180 have done so. The authorities made the announcement about the decision – taken earlier this month – through public address on Friday and Saturday. A north Tripura district administration official said a week’s relief was provided to the Bru refugees on Saturday evening. A total of 32,876 refugees had been staying in Tripura after fleeing their villages in Mizoram due to ethnic tension. “The government is very serious in asking the tribals to return to their homes immediately. But we are not sure whether they will start leaving their camps soon,” the official told IANS on the condition of anonymity on phone from Dharmanagar, 190 km north of here. He claimed that some refugee leaders were misguiding those staying put. 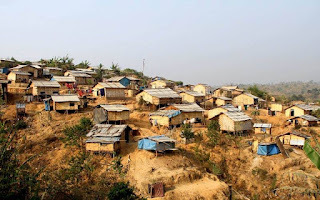 “The Central Government will stop relief and other assistance from October 1 to tribal refugees staying in six camps in Tripura,” North Tripura District Magistrate Raval Hamendra Kumar told IANS. The decision is in line with a July 3 agreement between Tripura and Mizoram governments, the Home Ministry and refugees’ body Mizoram Bru Displaced People’s Forum (MBDPF). The agreement entails benefits to each refugee family, including Rs 4 lakh aid, monthly allowance of Rs 5,000, Rs 1.5 lakh for building house and free ration for two years. As per the agreement, the Reang tribals, comprising 5,407 families, were scheduled to start returning to three Mizoram districts from August 16 or 17. But they refused and reiterated their demands, including security in Mizoram by paramilitary forces and allotment of sufficient land for farming, besides formation of Area Development Council for Reang tribals, locally called ‘Bru’. MBDPF General Secretary Bruno Msha said their demands were not incorporated in the agreement, including allotment of five hectares of land to each refugee family on their return. On the other hand, 177 refugees from 32 families returned to Mizoram on September 19 and 26. One refugee family left for Mizoram on Sunday. The District Magistrate, who along with SDMs of Kanchanpur and Panisagar is supervising the matter, said a few more refugee families were likely to return to Mizoram any time.